We added a user count toggle and chart visibility toggle setting to VoxVote. With these options available in the side menu you can control components on the screen. For example: if you have only 12 users with votes, and you don't want to show the 12, you can toggle with letter V. (press once the V, and the number is gone). Hide/Show chart? With letter C, you can toggle the chart display or not. Beware: if you are hiding both the chart and the vote count, you will see nothing! Missing your chart? And you have voted? Press letter C, or use gear in top left corner, and toggle the chart. As an example: Below you see the same votes, with on the left, the chart toggled off, and on the right, the chart visible with results. Q: Can you describe a best practice scenario for starters? Prepare questions a day or longer before the event. Use the preview button to test your questions. Inform your audience to bring their own device (BYOD - Bring Your Own Device), and inform about the live feedback options during the presentation. iPad or iPhone users can already download the VoxVote app from the app store, others can vote in a browser on https://live.voxvote.com. Always start with a fake/dummy question, for example: "What day is it today?" Or, "How many fingers am I holding?". This will allow the audience to get their devices, login anonymous, and navigate with the (web)app. When closing a question, interact with your audience about the results, for example: I see that 5% of the audience think that ..... can I ask you a question about that answer you gave? Use keyboard commands for starting and navigating through your questions. With letter 'S' you can start a question. 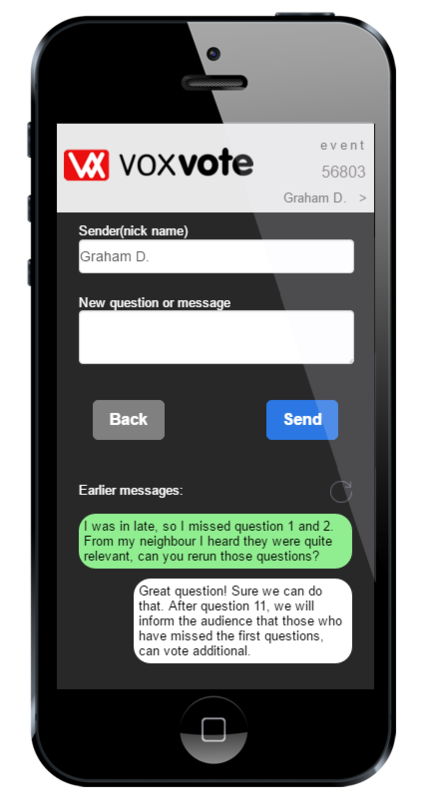 With 'R' you refresh the results to latest live data, with 'T' you can stop your question from broadcasting. Other commands are (N)ext question and (B)ack. (F)ull screen. A. Toggle the visibility of number of users (sometimes you only want to show the %, and not it was done from 30 users only). C. Toggle the control commands at the top of the screen. NOTE: If you both dissable the number of users, and the chart results, you won't see anything, so don't do that by accident! Q: How can I set the AutoClose timer and what is it? The autoclose timer allows you to set an interval in seconds. From the manually start of the question, the autoclose timer will countdown to zero. When the timer has run out, the live question will be closed and the results will be refreshed. If you want another run on the same question with same interval? Press start again. The autoclose dropdown can be found on the main edit screen where you have an overview of all the questions for your event. No autoclose: If you don't want the autoclose function to be used: set dropdown to -- no autoclose timer -- and set it with Preview or Live (to see the changes). Other values: If you want different seconds (5 seconds, or 1 hour voting time), you can change the value in the URL: countdownSeconds=60 will countdown 60 seconds. countdownSeconds=6000 will allow the question to be open very long. When using an autoclose value, the URL can be found in the live screen. Once the value is set, the live and preview from the start screen will also use the autoclose value. Autoclose settings are shared for all your events and questions. To prevent deleting important live data, we don't have a delete data button or function. But if you accidentially recorded test results in the live mode, we have the following suggestion. Make a copy of the question, and delete the earlier question. Hint: use the preview button to test your question. The delete question can be found by selection a question and use the red button. Hide/delete question. (PS: all data will be deleted). PS: deleted questions still count a a question for the free version with max 10 questions in an event. Q: Open answers - how does it work? In september 2016 we released open answers for free text input. 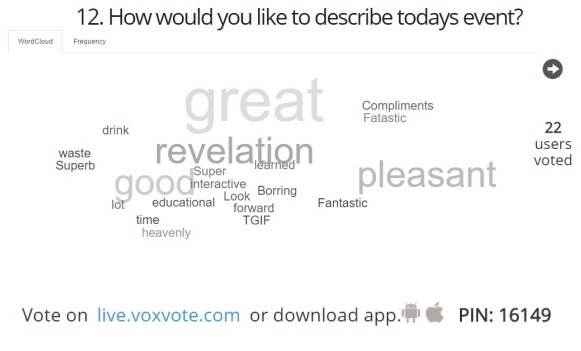 On the chart result page, we show both a wordcloud (textcloud or tagcloud) from the most common words used. Stopwords like the, in, on etc are removed from them. On each refresh, the wordcloud is re-generated with a different layout. On the 2nd tab, we also show the full answers given by the audience, where the most given answer is on top. The tab preference (WordCloud or Frequency) is remembered each session and through navigation. TIP: ask your audience to answer short answers. If you ask a question: What is your favourite color, ask them to answer Green, Yellow, Brown. And not: my favourite color is brown. TIP: when testing your result in preview mode, with only a few answers given, the text cloud might be looking a bit empty. The more answer given, the better. You can also paste this whole paragraph of text to see a great textcloud. Q: What are the main differences between the free and paid version? The free version has almost the same functionality as the paid version, with the following differences highlighted. For more details, compare the product list and packages starting at €80 for 4 extra credits, making you a paying customer with all unlimited options. Question Images - Allow to add an image to your question. Also decide if the image is only on the presenter screen, and or on the voting devices of your audience. 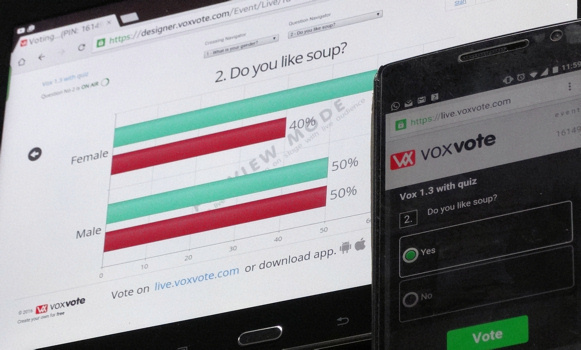 Create slides inside VoxVote and integrate them with your polling questions. No install or plugins needed. Branding/Logo - Yes, custom logo's on chart page. A default account logo, or individual event logo's are possible. 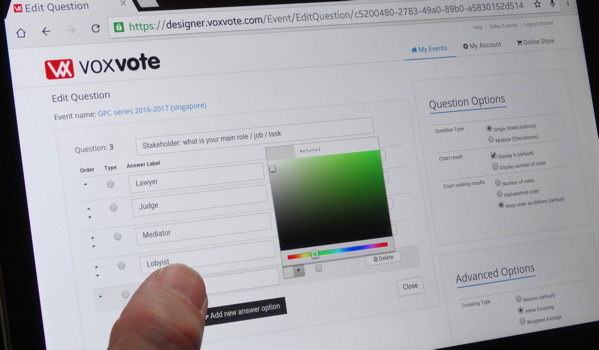 Register on https://designer.voxvote.com Paying Customers who want more. Note: Educational users and partners can have the paid version also for free. Allow audience to ask questions & moderate by host. With full screen preview options. (also known as message module) is available. Including moderate function, Export to Excel and Full Screen options. Per event the question and answer module can be switched on or off. 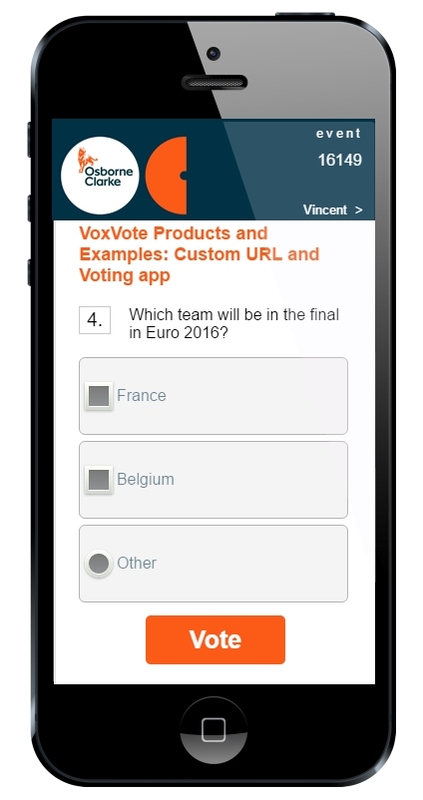 Custom URL for audience voting, with logo/corporate style for example https://osborneclarke.voxvote.com - Read more for details. Q: My presentation has a lunch break, can I continue after the lunch with same event? Yes you can, ask the audience to leave event from live voting app (this will save battery resources). They can come back later. 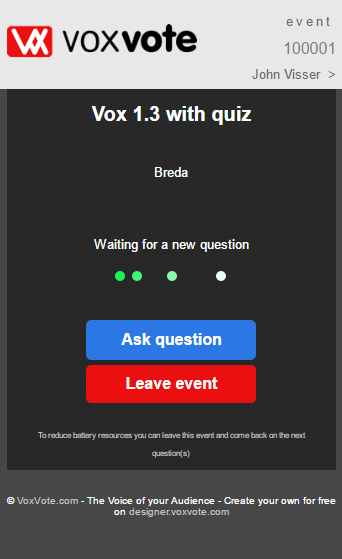 Q: VoxQuiz - How does the quiz option work? 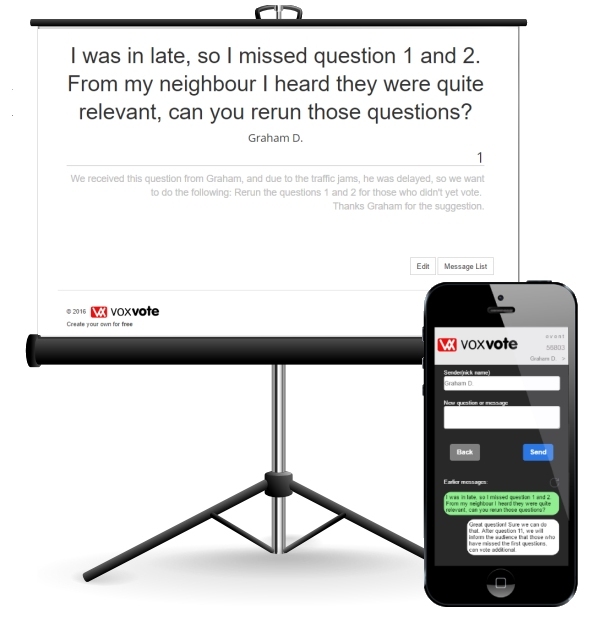 Q: We have limited budgets (as a school/educational user) to use VoxVote, are there special arrangements possible? Yes, VoxVote started already in 2014 with a special educational offer each year, we evaluate, and we keep adding it year by year so far. If you are an school or educational institute, you can check the list of schools already granted, and if missing, you can apply here. Q: How can I get support from you? The most how to questions are described on this page, or our step by step tutorial. On top of that you can also watch our video's on youtube. Sometimes, you just want to ask a question because you can't find it on the website, or you want to discuss some option. Please sent us an e-mail with your question. All our paying customers who have bought a Bronze package or higher, can also have phone support +31 6 83 33 51 56 , and for sales questions you can also contact us. Q: Can I change my personal PIN? No you can't, the PIN code is a random generated personal code for all your events. Q: Can I export all voting data to Excel? Yes, the export option is available for all paying users and free for eductional partners. An example of the export file can be viewed here. Per event, you can export the questions and answers, also for when you didn't have any live data, the preview data can be analyzed. Q: How can I hide my voting results and answer from the public website? You can use the 'Hide Project' checkbox in the event settings. Available for each customer who had achieved at least one purchase or are educational partners. In the free plan, all voting results are available through the VoxVote Search Results page. Basically: If you have recorded confidential results, or question options are confidential, you should upgrade the free plan to at least one credit purchase. Q: I want to combine questions - is that possible? Yes, we call it crossing, also known as segmentation, cross-tabbing, correlation, or live pivot charting. The crossing options are free an can be found per question in the Advanced Settings (Bottom right of the screen). If a question is marked as 'Allow crossing' the question can used for normal voting. But it also appears in the crossing navigator, where you can combine other (live) questions with the earlier reported question. In above example, the Gender question: Are you Male/Female was recorded normally. 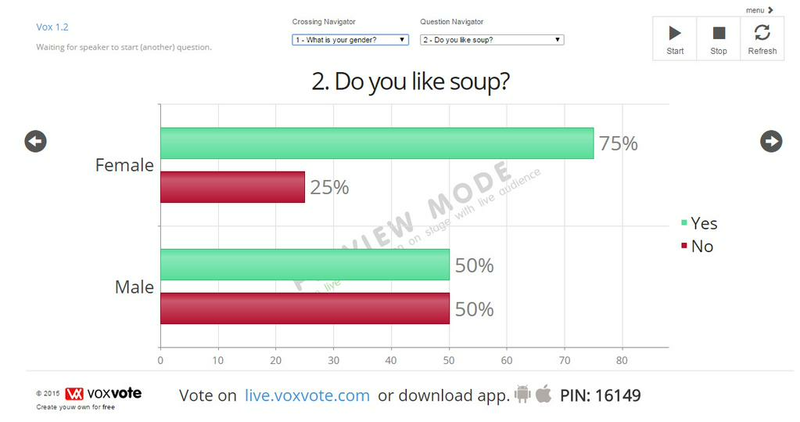 When recording the ' Do you like soup' question, the Yes/No soup answered are reported per gender. You can combine all kind of single questions. Where you can also use averages when having numeric 'weighted' results. For example: How many smartphone's do you have? And you can combine that with gender, or other questions. Important to know: A crossing (combination) will only combine the results for those who answered both questions. So in preview mode, finish all questions on the test devices, otherwise the combinations can't be made. Q: My event is open, audience can login, and the (empty) chart is displayed, but I can't collect responses. Press the Start button in the top right corner. A green indicator with the question number should be displayed, indicating the question that is accessible by all voting devices. In the following example, question 2 has been started and will appear on the screens of all connected devices. Go to live.voxvote.com in your browser. Q: Is there a maximum number of persons in my audiences? No you can have unlimited audiences, even on our free credit trial accounts. Our Azure platform scales automatically on heavy duty tasks. But in general, on large conferences (400 to 2000+ users) contact your event organizer and inform them that WiFi repeaters and accesspoints should be available and that you are using VoxVote for audience measurement. On normal conferences up to 200 persons, normal WiFi or 3G or 4G access is fine. Q: Why is a question not automatically opened on chart navigation? This is intended behaviour. The story on stage must be in sync with the questions. A speaker will first go to the question, and when everybody is ready, press the Start button. Q: During preview mode, I want to vote again, is that possible? Yes, on live web app (https://live.voxvote.com) , go back to the first login screen (leave event, or click on logo), enter the PIN again, and you can continue to vote in preview mode. preview (test/dummy) data in the chart show as grey results. Multiple test votes per device are possible. Live mode, when presenting on stage with live audience, use the green button to start collecting live data. In live mode you can vote only one time per question. Chart results are green. Q: Why is the chart not automatically refreshed (on a given interval)? This is intended behaviour. You have to refresh the chart results yourself. If we refresh automatically, the first live voting results might influence the other persons in the audience wo still have to vote. The speaker can decide the moment to Close or to Refresh. Both will show the latest voting results in the chart. 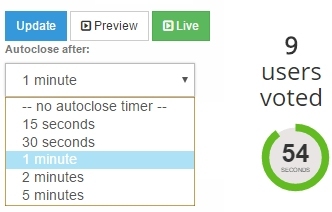 From VoxVote version 1.6 (June 2016) you can use the AutoClose timer settings. Where you can choose a timer in seconds. Q: My question and answer labels are not fully displayed. Most of the time, they are a bit too long. Use the preview to optimize your question text and answer labels. In general: a good question has only a few words, and answer labels should be short as well, easy to choose from. When presenting on a beamer, and the resolution is poor (800x600 or 1024x796), you can change the Zoom level to 80% or 90%. The designer/chart area will larger with more text. Example: in chrome, you can use Control and the mouse wheel to zoom in or out. Q: Can I buy company credits on one invoice, and share credits with my colleagues? The minimum credits that can be transferred needs to be 4 purchased credits or more. So with one Bronze bundle you can't share. We are working on a do-it-your-self user interface, but currently you can contact us with your requests, sent us the list with target email addresses and number of credits per user. (Note: we can only transfer to existing VoxVote accounts, make sure your colleagues have signed up and have confirmed accounts). Main global email provider accounts are excluded from this service (Gmail, Yahoo, Hotmail etc. unless you work at one of these companies). It must be a recognizable company/corporate mail address. Once transferred? The credit's can't be retransferred. It's one-way only. Q: How can I create a 'none of the above' type of question? Sometimes you want to allow the audience to vote on multiple answers, but one answer is special, it must deselect the earlier chosen answer. Which countries have you visitited the past 10 years? ( ) None of these / I don't travel. It is obvious that you can't select one or more countries AND selecting the last option. You can achieve this with the 'exclusive' option on a multiple question. In the question editor, select multiple on the right, and you can use the checkbox after the answer label to indicate which labels are special and exclusive. Q: How can I send email summary with all voting results to my audience participants? From the home screen, use the edit button on the event. The Event/Edit page shows the event details, then under the location, check the second checkbox 'Move to archive - event is over and has been voted') and update the event. When archived, there is a new option 'send emails', where you can see the number of respondents who provided their emailaddress on closing of the event. You can trigger the event of sending the email summary on any moment you like. An additional option is available to sent a copy to a special emailaddress, for example your own, or a colleague. Note: you can repeat sending to this extra emailaddress. Audience members will never receive a duplicate summary of the event. The summary of the event can also be found on this website under the event page. You can search for the eventname, the questions, the location and the anwer labelsto find the event(s) you attended, or searching for topics of your interest. Customers can also decide not to hide the summary event from showing on a public URL, for example on classified data and voting results. Q: I will reuse / duplicate / clone an event for another group. Is that possible? Yes, when you have a perfect set of questions and answers, and you want the same questions for another group/audience/class/workshop, you can easily make a full copy of the event. From the start screen (click on the logo), you see all your events. The button duplicate will make a full copy from all settings. Update the name of the event so you know which one is the new one, and you have an empty set of answers. There are some advanced features available (you don't have to find for Easter eggs in our software), but both on the designer and in our web based voting app, we offer the following functions. A. Voting Integration with extra parameters. autosubmit - when adding autosubmit to the querystring, your pin will be autosubmitted, so you don't have to ask your audience for entering PIN and press the OK (submit) button. This is a handy tool for sharing the voting links on social media or webinar/MOOC events. HINT: test it yourself, and make sure your event is open. nm= set's the name from the voter. In the app, you can ask your audience to fill in a nickname or other identifier to remain less anonymous. (Sometimes needed within a quiz, the organizer wants to know their audience). When you use the live.voxvote.com URL in a integrated app (for example XCode or Android or other web packages) you can use an iframe, and sent the known session name to our VoxVote platform. So it can place the nm= (nickname) already in the app. 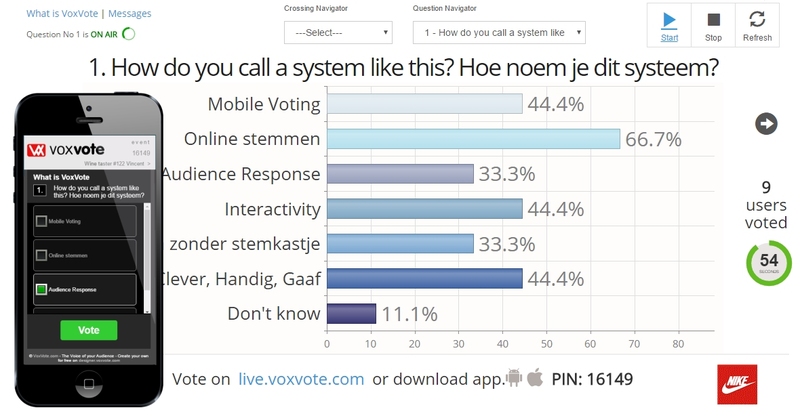 Example https://live.voxvote.com?nm=John Visser will set the name John Visser in the webapp. Example https://live.voxvote.com/?pin=100001&autosubmit&nm=John Visser will set the name John Visser in the app, and directly opens event 100001.
lck=y will lock the set name with the nm= parameter. So basically, your audience can't change the name or code you sent to the URL. For those who need this function, for example to embed the https://live.voxvote.com URL link in a custom app or platform. And want to know their audience. B. JSON realtime export from our API. If your in house development team can handle JSON, this might be a good option for real-time reporting, or real-time weighting. 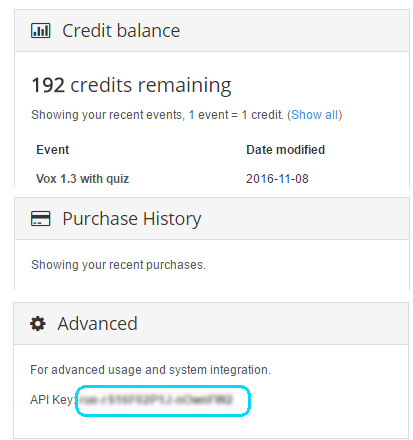 An API Key, which can be found on the my Account page - for paying customers only. An optional switch for 'Live data only' or do you want the test/preview data also to be included. liveOnly=True will give your live data, liveOnly=False will give you all data. An example which will return [ ] (because an empty event, and non-existing APIKey), but the format is correct. Q: Is there a native app available? No, not anymore, after 3 years we stopped in November 2017 with developing and supporting native and hybrid apps. Main reason: the apps were used only in 10% of the cases, and the constant changes from Apple in their Xcode and changes in devices made this decission easier.